These kinds of nights happen to me periodically. Sleepless ones. Not forever sleepless; I'll get there eventually. Frequently, four o'clock represents some sort of turn-around point. If that holds, I'll be getting sleepy in less than a half hour. I've read to Cuppa, read to myself, listened to a CD, listened to Real Live Preacher's version of the Christmas story on my iPod, and even practised a few line dances. I'd play the fiddle, but Cuppa advised me against those kinds of shenanigans on another night such as this several months ago. Oddly enough, I slept really well last night, and I'll probably be fine tomorrow night too. There's no telling when nights such as this will occur or why. It simply happens. Sometimes, I ponder things when I'm in this state. Tonight, I pondered how my blog world and corporeal world are almost two separate entities, two circles with no overlap. It's not entirely true, of course. Some corporeal friends and kin do follow my musings, but, for example, I have (or had) a good email friend who lives in New England. We've got along quite well, even visited back and forth in body, so to speak. But I got frustrated around the time of our move about a year and a half ago. I think the move was stressful and that was compounded by the back problems that I endured at the same time., and I didn't do very well with email for a while. I kept it up but found myself getting frustrated with having to say things that I had already said in my blog. I found it hard to fathom why she didn't read my blog, and I think my frustrations came though a few times. What can I say? I'm only human after all. It's not as though I ever stopped writing emails, but I perhaps wrote shorter emails for a while with a greater interval between them. However, probably both before and after that period, I was then and have been now the more faithful emailer between the two of us. I tend to write soon and at some length and then wait and wait for her shorter replies. We continue to send Christmas cards and small Christmas gifts to New England but have received neither card nor gift from her either last Christmas or this. She used to send us a poinsettia — did so for a number of years. Not any more. Not even a card. I last wrote to her in mid-November and have yet to receive no a reply. Relationships decline for various reasons. I understand and accept that. But I fuss over the blog thing. Why was she never interested in reading my thoughts and accounts in that forum? Why was it that only emails counted? It's not that I ever did or ever would stop writing emails, it's just that the blog would provide even more information for such friends. She's not the only one. We have other friends and family who simply aren't interested. Don't get me wrong. We get along just fine and dandy when we meet and spend time together, but they care not a fig about what I or Cuppa have to say about ourselves or our thoughts in our blogs. I don't understand it. I don't say it's bad or that they're evil. I simply say that I don't understand. I don't mean to say that I expect anyone to be held in thrall by my trenchant prose or be emotionally moved by the pictures that I post. But if I knew a friend who posted of their thoughts and doings, I rather think that I would be interested to keep up with them. What are they thinking about now? What's going on in their lives? I'd want to see their Christmas pictures. I'd just be interested. We're all different, and it's not for me to understand everybody else, for goodness knows that I'm at pains to understand my own self. I'm simply saying that I don't understand this. I'm not condemning, just puzzling. Are your experiences similar or otherwise? How do you explain such indifference? I welcome your thoughts. Meanwhile, we're off to the country for New Years, but we won't be away long. And I will take the laptop, so there's even a possibility of hearing from me, even with the pathetic internet connection up there. For years now, I have been reading to Cuppa at bedtime. However, there hasn't been much reading for the past few months: not since we finished Lord of the Rings for not the first time. Not every book is suitable for bedtime reading, and we couldn't seem to settle on anything for quite a while. Then, while browsing through the library recently, we discovered a new (for us) book by Philip Gulley, a Quaker minister who writes The Harmony series. We had previously read three or four books of this series, but we had mistakenly thought that we were up to date. Thankfully, there were three more in the series; we're now on the second one that we had missed (which is really the fifth in the series). Harmony is a mythical town in Ohio. 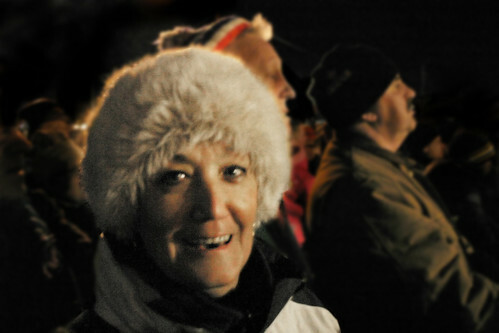 Gulley brings it to life in a series of anecdotes about its various inhabitants. Although there is continuity and plot development from one book to the next, each chapter of each book can also stand alone as a short story. That makes it great for bedtime reading. The length of each story also works well for us; we can usually read a chapter in one sitting er ... lying in twenty minutes, give or take. (I'm guesstimating; I've never timed it.) Presently, we are reading A Change of Heart. We've missed the one directly before that, but we're able to enjoy this book regardless, just as we'll be able to enjoy the missed one when we are able to procure it. If you're a bedtime reader, either alone or otherwise, you might like to try this series. As I said, it works well for this purpose. Aside from the convenient structure, they're also feel good books that won't leave you feeling distressed at bedtime. Somehow, Gulley is able to achieve that while examining the reality of human foibles. Besides, Harmony in the bedroom is a most excellent thing. Is it not? I know that I've been flooding you with lots of pics lately. I promise to stop soon. Meanwhile, here are a few photos from Christmas 2 that was held on the proper days according to the calendar. Our first round of Christmas took place a week earlier when Bug and Puff were home. It was a little weird splitting Christmas into two parts, but you do what you have to do and make the best of it, and most of the time things turn out alright. Above: two pics from Christmas Eve. SIL was in a fine mood both on the eve and on the day as you will see later. Family tradition holds that we lay out some nice snacks on Christmas Eve, so both photos were taken in the kitchen while the food was being prepared. Below: Butterfly is pleasantly surprised to see that she has received a CD of the Trans Siberian orchestra in her stocking. SIL had already found a Superman T-shirt in his as well as a pair of gloves. You can see him wearing one in the photo. Above: SIL clowns around while preparing breakfast on Christmas morning. We males don Santa hats in the morning, but we soon get too hot to keep them on. Below: a photo op with daughter and parents. Below: on Christmas afternoon, we settled in for the George C Scott version of A Christmas Carol (aka Scrooge). We had watched the older Alistair Sim version on Christmas Eve. The tv shows Scrooge standing on the grounds of his boyhood boarding school where the Spirit of Christmas Past first took him on the first leg of Scrooge's journey of reclamation. Even though we were without snow in Canada this year, apparently they had plenty of it in Victorian England. Sure sure. So, I guess that's another Christmas in the record books which must be rather wonderful for my dear readers who have no doubt had quite enough of it and my family photo. But in case you haven't, Cuppa will soon post her choices as well. Today is Boxing Day in the Canada. Although Wikipedia offers various explanations for its origin, it's first listed possibility is that "It was the day when people would give a present or Christmas 'box' to those who have worked for them throughout the year." I'll go with that one because it's pretty well the version that was passed on to me. The custom may actually have its origins in feudal times as an obligation of the lord to the serfs. After being served by his serfs on Christmas Day, the lord would provide them with a box full of "practical goods such as cloth, grains, and tools." It's still an official holiday in this and most countries of the Commonwealth, and it still has to do with merchandise as it is the biggest shopping day of the year. We don't do Boxing Day that way. For us, it is a day of quiet relaxation after the hustle and bustle of getting ready for Christmas, and we had two Christmases to hustle and bustle for this year. One year long ago, however, Cuppa had the insane notion to take the kids to downtown Toronto on Boxing Day. The crowds were incredibly dense, and we feared to lose our children in the crush. We held on very tight and extricated ourselves pretty darn quickly. Neither Cuppa nor I enjoy the push and jostle of the crowds very much. At the best of times we tend to eschew big malls in favour of smaller shops. Besides, I don't know about you, but we're always pretty broke after Christmas and can't really afford those incredible bargains for stuff that we don't need. Some people claim that they begin shopping for next Christmas on this day but that doesn't appeal to me either. Buying presents is part of the buildup, and I won't be ready to be start getting back into the process for about another eleven months, give or take. What we do have to help us enjoy this Boxing Day is a modest covering of snow. Much too thin to be called a blanket, let's call it a sheet although that may be not be the best description either because it tends to connote a sheet of ice. 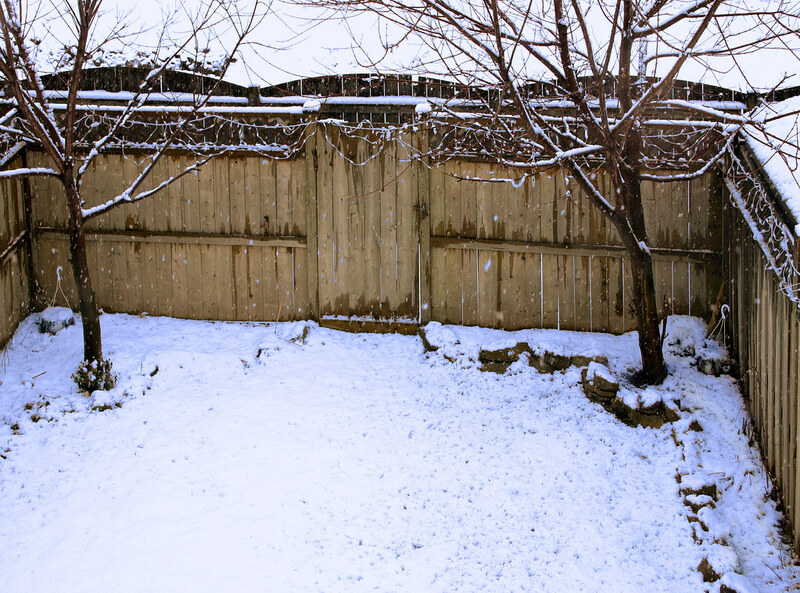 Regardless, after several weeks of mild and/or rainy weather which produced a green Christmas for us yesterday, it's rather attractive to look out the window and see the white covering. And really, the snow did come in time for Christmas Day in a way, for it was falling when we left the kids' place at eleven o'clock last night. I'll probably bore you with Christmas pictures at a later date, but right now I thought I'd share the sheet that covers our back yard . It's pretty enough, don't you think? Here we are — Christmas Eve — although that always confuses me. Is it Christmas Eve for the whole day or just in the evening? It seems to me that it has become the whole day, but my memory informs me that it wasn't always that way. Regardless, due to the day that follows, it's a special day in the calendar for most of us whether for religious or social reasons. In some traditions the faithful attend church on this eve and then open presents. I suppose that traditions are exactly that and that they always feel right to those who hold them. However, I'm rather glad to have had and still to have the anticipation of Christmas Morning and the excitement of both children and adults descending to unwrap their bounty. Bug, in particular and much to the consternation of Butterfly, used to get us up pretty darn early, but her excitement was both charming and contagious. Oddly enough, she now appears to be the family member who is least enthralled with the event. In the spirit of traditions, may I also inform you that ours went well yesterday. The Christmas turkey got cooked to perfection, carved and made ready for tomorrow's feast. Our burgers and fries from the local and independent Katchups Grill were wonderful. At the Grill, when I confessed to be a first-timer, they proudly informed this new but not last-time patron that not only were their fries made fresh but their burgers were also done on-site and contained no fillers. From now on Katchups will be my burger joint of preference in this town. For a number of years, I made my own Christmas cards, printed them on my own printer and sent them out. I'd even design and print the envelope as well. Some people told me that they even saved the envelopes. Well, I'm either getting lazy or it's a case of been there and done that for this is the second year that I have resisted that making that effort. Last year I did post a previous card on my blog when I also wrote about this very same day in Fine Turkey, Greasy Burgers, and Best Wishes, but I have nothing for you this year except my best wishes and a referral to this card that I found on Debra's blog, As I See It Now. It's from Ashland University and is quite wonderful. When you click here, read and follow the instructions to the bottom left in order to view the whole card as it is presented. I will try to visit as many of your blogs that I can get to and wish you the same there. Then, I think that I shall give you all a break for a few days. Be well. I appreciate both your posts and your comments. Keep up the fine work. Christmas Part II is beginning to unfold. The turkey is roasting in the oven and beginning to permeate the house with its aroma. Cuppa put it in the oven this morning. I helped with what I could by chopping up various items such as the dried bread for the stuffing, but the lady is in control in her highly organized and efficient fashion. As I have said previously, in order to make Christmas Day more relaxing and pleasant, we pre-cook the turkey a day or two before and heat it up on Christmas Day. I highly recommend this method and assure you that no flavour is lost by cooking it ahead of time, or if it is we sure can't tell. As we finished, I told Cuppa that I wanted to post more Christmas Part I photos before Part II transpired. (You may recall that we celebrated Christmas last weekend when Puff and Bug were home, but we have left the stockings and turkey for the 25th.) Of course, as soon as I mentioned the photos to Cuppa, she clamoured that she wanted some photos for her blog too. Naturally. So you'll remember to check there too, won't you? So, I slightly processed eighteen photos and uploaded them to my Flickr account (you can view them all there) and then grabbed some of them to post below. It's been pleasant sitting here and doing that while listening to Christmas music from my iPod (on speakers). I have 182 Christmas songs uploaded, and there are a few more albums to process if I get around to it. Does that seem like enough to you? Can you tell that I like Christmas? In a while, I'll go out and procure our annual burger and fries. I don't know when we started this tradition exactly, but for years we have done this on the day that we cook the turkey. Back in Sarnia, I chose Burger King for this meal, but since there are none in this town, I chose Harvey's (a Canadian chain) last year. However, there's another independent place in town that I think I'll try this year. Supposedly, they serve fries from freshly cut potatoes, and they're supposed to be rather good. I'll try to post one more time and to visit many of your blogs, but in case things go awry, I'll take the opportunity to wish you a Merry Christmas now. It's odd but rather grand that we all got connected like this, but I'm glad that we did. Oh, some of the photos are from Butterfly's birthday. The two celebrations pretty well ran together. ... as seen on many blogs and, therefore, attributed to no one. 1. Hot Chocolate or Eggnog? Hot chocolate, possibly because I haven't had much eggnog in my life. If you were to say that eggnog can be spiked, I point you to Bailey's in hot chocolate. 2. Does Santa wrap presents or just sit them under the tree? Wrapped or placed in bags. Unwrapping is half the fun -- some of the fun anyway. 3.Colored lights on tree/house or white? Coloured. The occasional white house (so to speak) can be classy, but it got to be too much a few years ago when so many switched over. 4. Do you hang mistletoe? No dammit! Unfortunately, it's a custom that we never latched onto. Daughter has some up though, and I try to take advantage by times. 5. When do you put your decorations up? 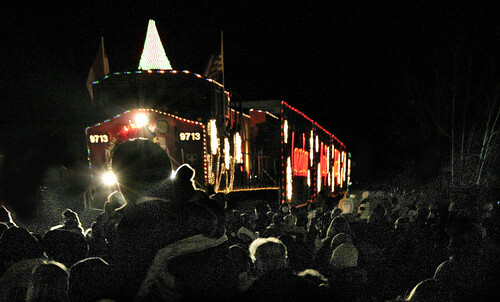 Towards the end of November -- in time for the Santa Claus parade. 6. What is your favourite holiday dish? I like the whole package: turkey with Cuppa's fine stuffing; those wonderful cheesy potatoes etc. 7. Favorite Holiday memory? I never do well with favourite questions. My mind goes blank. I have not disliked many Christmases if any. Okay, my favourite is 1972. Butterfly came home from the hospital on Christmas Day. There was, however, a harrowing aspect to a having a screaming baby in the house. But grandma came and got her settled. 8. When and how did you learn the truth about Santa? From a neighbourhood French girl who was remarkably bilingual at five years of age. 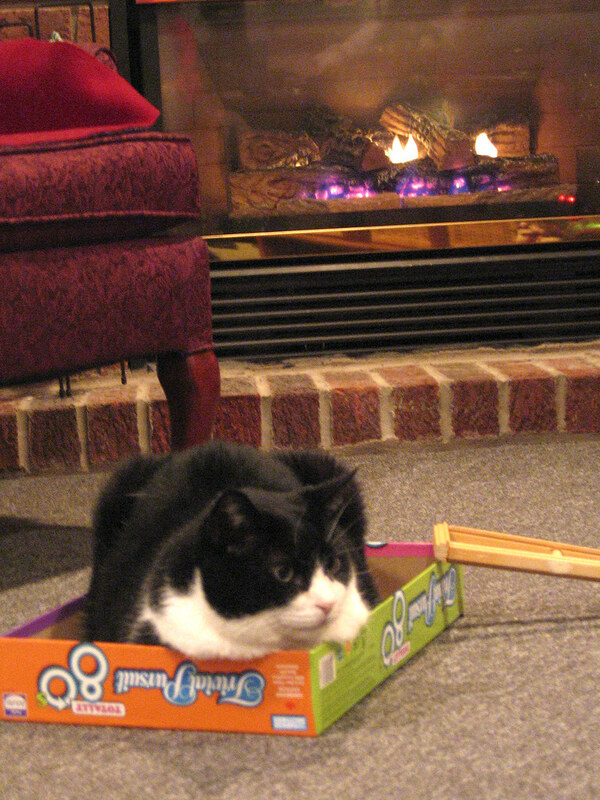 We were playing ay my house, and I pulled out a box of something or other from under a chair and must have claimed that it was an early gift from Santa. She advised me that there was no Santa. 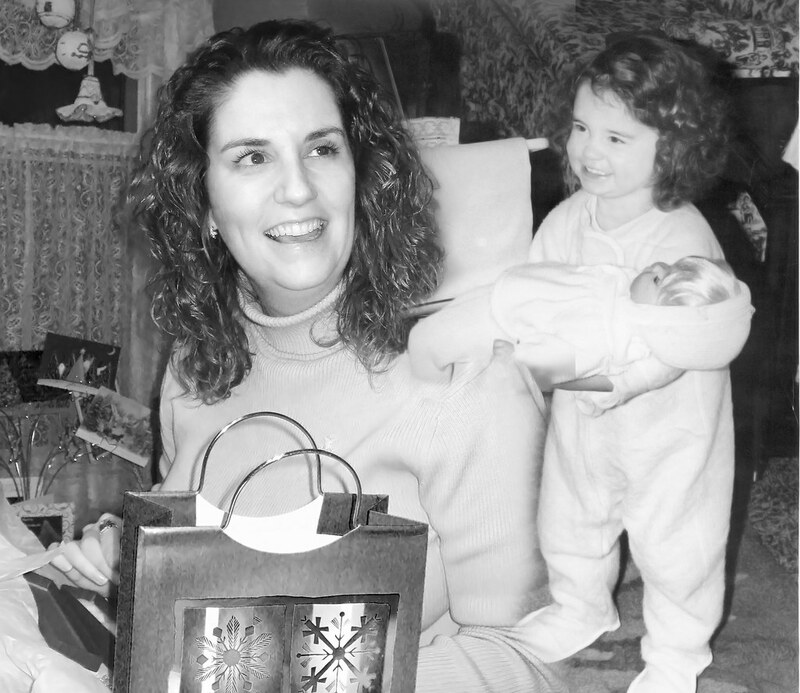 We soon agreed that even though most gifts came from parents that Santa brought one present, but in my heart of hearts, I knew that it wasn't true. 9. Do you open a gift on Christmas Eve? No, although there was a time when we permitted the kids to open one gift -- pyjamas. 10. How do you decorate your Christmas Tree? How else??? 11. Snow! Love it or Hate it? Snow is pretty and wonderful in the right context, especially new-fallen or rural, still-pristine snow. 12. Can you ice skate? Yes but not well. In addition, I turn clockwise much better than counter but all public skating always goes the wrong way for me. 13. Do you remember your favourite gift? My first bicycle, I guess. I was nine (I think) and had only learned to ride the previous year on friends' bikes. 14. What's the most important thing? Family time. 15. What is your favorite Holiday Dessert? Hmmm, we had apples pies at one point, and that would be it hands down. I can't remember my last homemade apple pie. Maybe I should learn to bake, eh? 16. What is your favorite holiday tradition? We always do a Christmas Eve get-together with various snacks. And I also like getting a greasy burger and fries the day that we make the turkey (we cook it a day or two before Christmas). 17. What tops your tree? A lighted star. 18. Which do you prefer giving or receiving? Both giving or getting the right and appropriate surprise gift is most exellent. I don't want to say giving just to be politically correct, but I think I'd have to go with that answer. 19. What is your favorite Christmas Song? What did I say about favourites, eh? But how about Il est ne le divine Enfant (sorry about the missing accent) for this year? 20. Candy canes, Yuck or Yum? Neither: so so. These T-shirts were Christmas presents from Bug and Puff this past weekend. They bought them and made them here or so I understand, but they were inspired by Thailand. 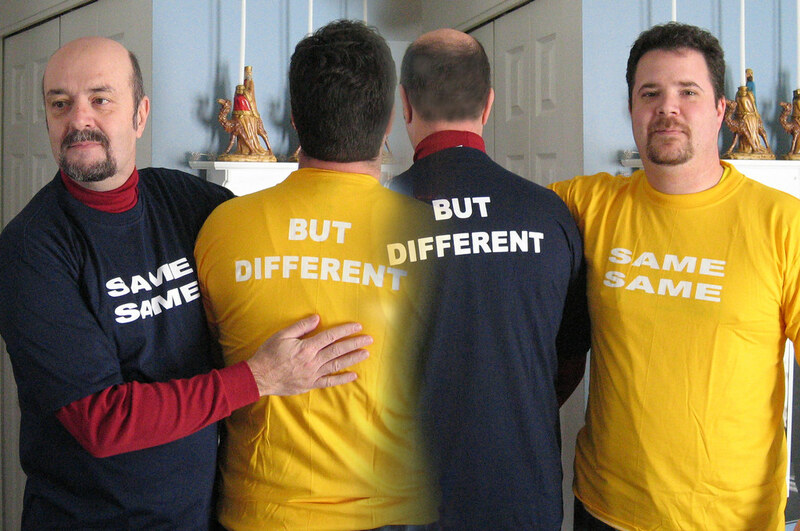 Apparently, "Same, same, but different," is a familiar saying over there. I guess it means simlar but not exactly the same, just like these shirts. SIL and I may be Same, Same in some ways, but we are also very different. We are of similar height and even looks. We even hail from the same city, Montreal, a hockey-crazy city although neither of us have ever officially played the game and neither of us skate particularly well. But we're also different. I am more of a bookworm, but he is a hands-on kind of guy. I'm English; he's French. I'm a bit reticent, but he's a friendly sort who will happily talk to anyone. So, we're Same Same, But Different. In the interest of full disclosure, I must confess that I patched the hair on the back of my neck in these photos. In these latter days, it [my hair] pretty well stops near the top of my ears, leaving a few messy draggles for lower. Frankly, it's hideous, and I hate it. I don't so much mind being bald on top, but I really detest that horrid back of the neck thing. So, even these pictures of me are Same Same compared to real life but different because of the adjustments that I made to me 'ead. Not that there's any sort of moral or deep truth to my prattling, 'cause that's all that I'm doing — prattling. The old expression, "The more things change, the more they stay the same," seems like an appropriate caption for this photo. As you can plainly see, Butterfly was totally and ecstatically thrilled to receive this birthday present many years ago. We still all fondly remember the doll called Saranella. She laughed and giggled delightedly when held in the appropriate way. In was an infectious laugh that made everyone else want to join in. But this post isn't about the doll; it's about the girl, who is a doll in her own right. Her smile warmed and delighted me then, and it does now. The similarity between the two photos taken more than three decades apart stuns me. Some things do stay the same. And that's good. Very good. 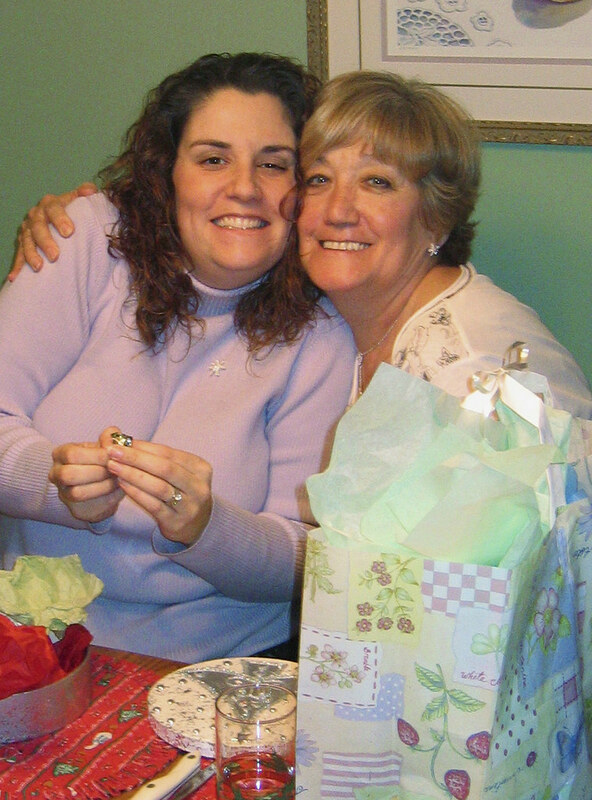 Below, in a delightful picture, Mother Cuppa and Daughter Butterfly share a hug over a birthday present. Don't you agree that it is a wonderful moment to capture? Unseen in the depths of the womb is my little grandchild, Smudge, whom I am sure is also smiling ... as am I. And may God bless us everyone! After talking about dress codes a bit recently, I was reminded of this old photo. 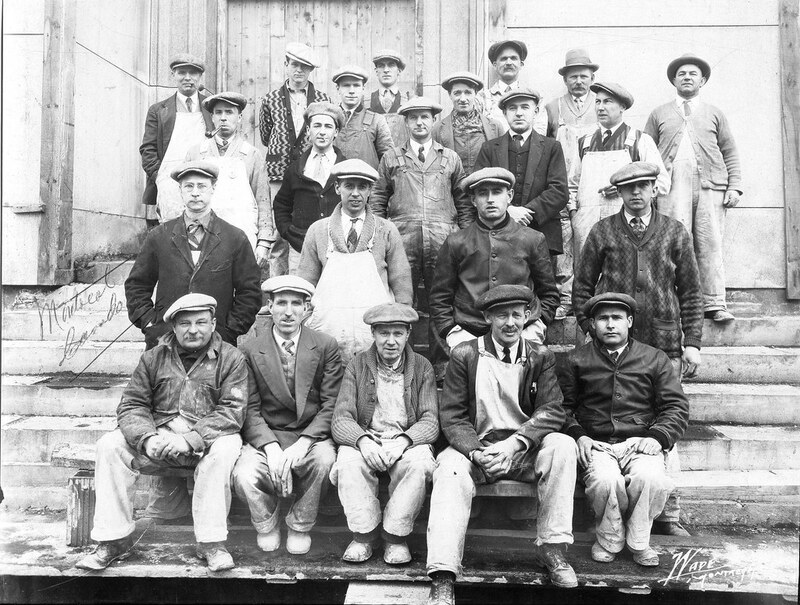 These are bricklayers on a construction site in Montreal in the 1920s, I guess. Look at the hats: they all have them, and they're almost all of the same type — the baseball caps of the day but so much classier. Look at the guy in row 3 with his cap turned backwards — a rapper before his time. I guess it's true that there's nothing new under the sun. Did you happen to notice the ties? It's a construction site and they're wearing ties! Was it just because it was picture day, I wonder? My grandfather is on the extreme left of the second row. He was a genuine Christmas baby, born in Barking, England on December 25, 1879. The story goes that his father taught him the bricklaying trade in the family backyard. Arthur was the only tall person in the immediate family. My parents, uncle, and three other grandparents were all of diminutive stature. Height, however, seems to be the only visible thing that I inherited from grampa, for I sure didn't inherit any of his mechanical aptitude or his ability to work at heights. Put me one rung up on a ladder and I get queasy. He, on the other hand, worked on skyscrapers. Yes, this picture was taken at a construction site: the Sunlife building in Montreal. I think it was close to thirty stories high. Later, he worked in New York on either the Empire State building or the Woolworth building or both. I never did get the story straight. Why the family returned to Montreal, I'm not sure. Perhaps because it was closer to eastern Ontario where my grandmother's family lived. Back to the hats. I don't mind hats either but not the ubiquitous baseball caps of the present era. They don't do much for most guys in my paltry and unworthy opinion. But I have had caps that were more or less of the style shown in the photo, even though they have never been trendy in my era. Maybe I'm an old soul. Eh? 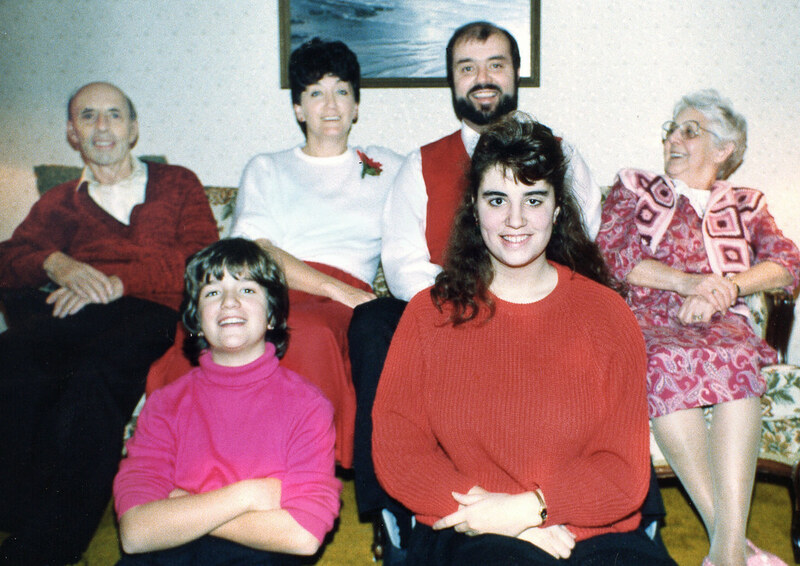 That's our family during one Christmas in the mid-eighties. Of course, Cuppa's parents were still with us, but we always made the pilgrimage to Toronto to visit her tribe on Boxing Day or shortly after. When I asked Cuppa where mid-eighties photos might be last night, she escorted me to the basement and found the appropriate box within minutes. She's amazing at finding things — inside the house at any rate although something fundamentally shifts the second that she steps outside. I had wanted a photo of that red vest sweater that I mentioned yesterday. While it's only partly revealed, the picture serves the purpose, I think. So, that's my semi-dressy-garb of that period. I say semi because I still wore jacket and tie to church although that was the approximate time period of our ceasing to attend that institution. Taken via a timer with the camera set on the piano, it's not a technically sound photo by any means, but it's still a wonderful keeper in my books. I wasn't able to make great strides in Photoshop with this one (it happens that way sometimes), but it's the way we were, and I think it has value and character. Christmasses keep rolling on by faster and faster. Life has changed. We're all older and living in different places. The grands have left us and partners have joined the girls ... and little Smudge is on the way. Now there's a change that I am really looking forward to. But I still gaze back wistfully and fondly and sometimes find myself becoming a teensy bit sappish over my comtemplations. Back in the early seventies which were also my early days of teaching, I took off my tie one day while school was still in session. It was a very hot, you see, and owing to its location my room was exceptionally torrid. I had windows but no view unless you count a gymnasium wall a view. The sun beat off the wall, off the gravel between the wall and my windows, and into my room. So, I took my tie off late one sweltering afternoon. My assistant department head was scandalized: "Tut, tut, tut. AC, you never take your tie off. You just don't." Being a rookie, I complied and knotted the cursed thing back up, but little did I know that I was in the vanguard of change. It wasn't long after, maybe even the next school year that some impudent young upstart teachers took it into their youthful heads to come to school tie-less. Perhaps it began as a stroke of warm weather sensibility. And you know what? The earth continued to rotate on its axis, neither did the moon didn't fall from its orbit. In fact, I guess no one scolded them because they continued to do it. I can't remember exactly when I joined the trend for good … or mostly good, because I'm sure that I was still happy to dress up the rigours of the dress code on many days and in appropriate weather. Let me hasten to assure you that most of us were still relatively well-dressed specimens. We'd don our dress shirts and properly pressed pants. Heckfire, I even had hair to fuss with back then. According to my recollections, that transitional phase of dress lasted for about a decade. I particularly and rather fondly recall one outfit of those times. One Christmas Cuppa gave me a wonderful red vest sweater. I loved it. With that and a clean white shirt and a tie (when I was in the mood), I felt pretty good about my appearance. However, I did say that those were transitional times. Soon the dress shirts disappeared too. Some guys, but not many because we still had some pride, would even wear blue jeans to work. I don't think I ever did that, but I did ease into more casual and comfortable (but still decent) slacks. It wasn't just a set of rebellious young teachers, however; a whole societal change was occurring. As I have recently posted, we have recently attended concerts in rather plush venues and even churches – okay one plush concert hall and one church. Of course, I dressed up a little for those events: put on dress pants and worn spiffier-than-average sweaters. But I needn't have bothered … because few others did. Denims and other very casual clothes seem to comprise the sum total of the modern wardrobe. I don't condemn that, for those items are the staples of my wardrobe too; comfort is important after all. I am merely surprised by the degree to which we have changed and the relative rapidity of the transformation. I look at photos and film clips of old sports events. Even at hockey games and baseball games, the gents were all suited up. It doesn't make much sense to us now, but that was the way of it. Perhaps it felt like an achievement to be able to dress up and go out. I don't know. I wonder if this is mostly a North American phenomenon. I understand that Europeans are much more fashion conscious, for example. I also recently saw pictures of business people in one of the Australian cities at lunch time. Based on those pictures and when the photographers reported, black business dress is most assuredly still in fashion Down Under. Personally, as long as we are clean and neat, I prefer the casual look and feel. What about you? When I posted Into the Season the other day, many of you opined that we had been quite the busy, little, festive Canadians. I guess when we present lists like that, we can appear to be busier than we really are. So, when I say that we have now attended three concerts and not just one (plus various other functions), I don't want you to get all concerned about our apparently frenetic pace. We're okay. I wonder how many years it's been since we attended even one concert? Suddenly, within eight days, we chalked up three events. They were very different, both in presentation and venue. The kids treated us to tickets to see/hear Stuart McLean who told his funny Christmas stories and presented pop-style music at the rather grand National Arts Centre, a grand edifice with those fancy box-balcony seats that some can afford. Then, friends took us to hear an a cappella chorale group at a decent-size church. The building was neither opulent nor shoddy: just a normal church. The chorale was very talented but a little on the snooze-button side of the continuum. Finally, on Sunday evening, we found ourselves in a small hamlet way outside of the city (Yes well, a hamlet would be small and outside of the city, wouldn't it? C'mon AC, what are you thinkin?) The definitely non-opulent community centre was filled to capacity with only about one hundred onlookers. But it was loads of fun. 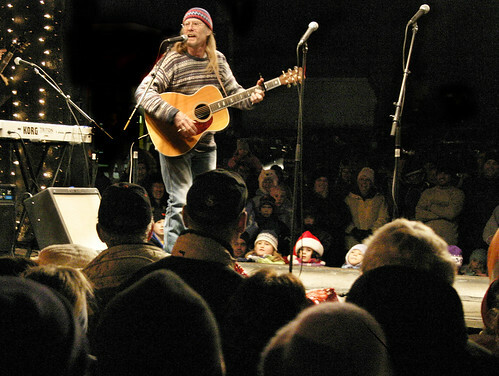 They played zippy Celtic music and had the audience participate in many carols. I think we all, musicians and audience alike, enjoyed the enthusiastic and cheery spirit of celebration. During the intermission, they had doors prizes (we won one of the four) and a Share the Wealth draw (we also won one of those four prizes). Share the Wealth wasn't exactly a 50-50 draw but along those lines. They drew four numbers, each getting a twenty dollar prize (which was the admission for two, so it was a good deal). You could buy one ticket for two dollars or an arm length's strip [really!] for five bucks. What a good idea! Nearly everybody went for the arm's length deal, and the organizers, therefore, generated more cash. Very clever! Why wouldn't they all do it this way? Having won the draw, which essentially amounted to free tickets, we ended up getting to three concerts – all free! It's all rather odd because we are not generally lucky types who end up winning lots of things. I wonder how long it will be before we get to our next concert? Continuing a theme: here another partially, but only partially, restored photo of my mother's father's mother, Mary Ann Quinlan (nee Baker). It was taken in Barking, England. As far as I can tell, Barking is part Greater London. I actually found the street and looked at the satellite view on Google Maps. If I'm looking in the right place, the land use has changed, and housing such as this doesn't exist in that area any more. I assume that my great grand father, John Quinlan had passed away by this time. That's her son, Edward, standing beside her in the photo. 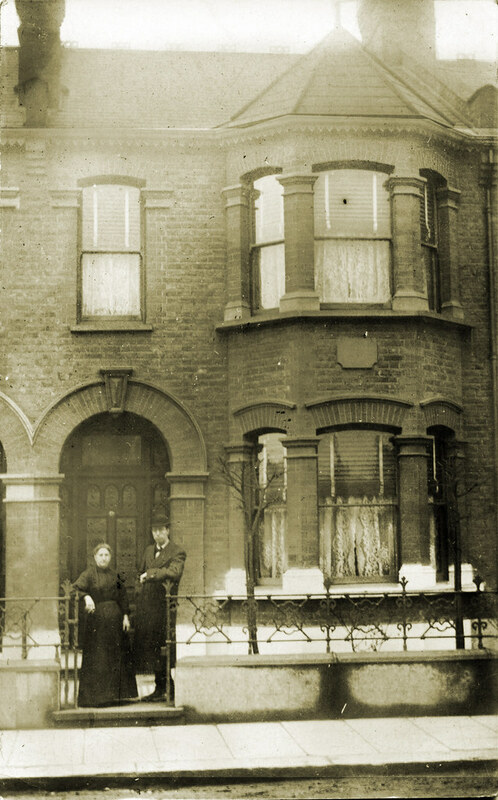 According to photo album notes, sons Edward and Earnest remained in Barking, and another, Charlie, was killed in World War I. John emigrated to New Zealand, and my mother continued to write to him until he passed away. I remember getting calendars and tourist books form New Zealand. I always wanted to visit and never will, and I'm okay with that. There were three girls, Clara, Polly and one unknown. My own grand father, Arthur, emigrated to Canada (obviously), but the story is that it took him a long while to actually settle here. Apparently he went back to England three times before staying. It is also said that he went as far west as Winnipeg before returning to and settling in Montreal. 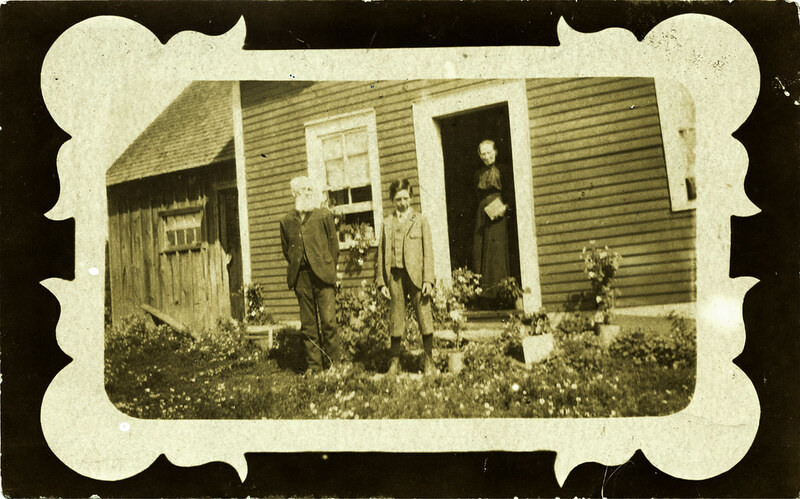 This partially, and only partially, restored photo shows my great grandparents, Israel and Elizabeth Robinson (nee Drew) and their son, George. The picture was taken at Cashion's Glen, near Cornwall, Ontario. Elizabeth was the daughter of my great great grandmother whose picture I showed in a previous post just a few days past. Israel was a farmer and cobbler who seems to have be a rather hardy individual because a photo album note says that, when he was in his seventies, he walked thirty-five miles to visit his brother in Glen Robertson. I don't know if that was one way or both. He may have been the brother or other relative of the John Beverley Robinson who was the first attorney general of Upper Canada. The same relationship might also exist between him and Peter Robinson for whom the city of Peterborough, Ontario is named. Apparently, Peter led a group of immigrants from Ireland to settle in that area. 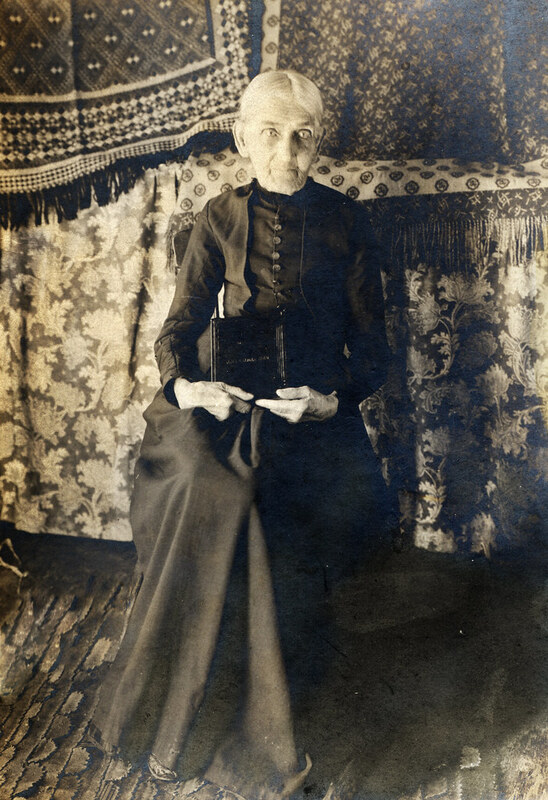 My grandmother, Charlotte or Lottie, spent some time back at Cashion's Glen caring for her father, my great grandfather Israel, after he fell and broke his hip. My mother and uncle spent some time there too as children, but I think they were all back in Montreal when he died. I believe that Great Grandmother Elizabeth was the one who visited from one family member to the next to end her days. I'm sure that she couldn't keep the farm up. I remember my mother telling of either having to give up or share her bed with the old lady; I forget which. The boy, George, died when he was thirteen. My grandmother had two sisters, Bertha and Mamie. I knew Bertha's daughters and their children, but I never met Mamie who ended up in California. However, I am indebted to her for sending me the first novel that I ever read, The Bobbsey Twins at The Seashore. My memory tells me that I started it one day in the summer when I was seven and was quite surprised and proud that I finished it. After that, I read many other Bobbsey Twins books before moving on to The Hardy Boys and others. This is the branch of the family that has longer roots in Canada than all of the rest, on both his and her side, I believe. Several years ago, I went to Glen Roberston and found some grave stones of some Robinsons but not of these people. Now I know that they lived in another settlement, and I think that they were buried on the farm anyway: at least my great grandfather and his son, George, were. I'm so glad that my mother put these albums and notes together for us. It's neat to learn some of the stories and to think that I and my offsrping carry some genetic material from these folk. I saw this little quiz on Don't MAKE Me Get My Flying Monkees. What the heck! It's something to post on a Saturday. Almost all you have to know to ace this sucker is there, they're, their, it's and its. Way to go! You know not to trust the MS Grammar Check and you know "no" from "know." Now, go forth and spread the good word (or at least, the proper use of apostrophes). Are You Gooder at Grammar? I have been trying my hand at scanning and trying to improve upon old photos. I'm just getting started and have a lot to learn. Maybe as I learn more, I'll get back to this one and do a better job. It's hard to know just how much to fiddle around with these old treasures. This particular photo of my Great Great Grandmother (maternal) is the oldest photo that we have. I don't know when it was taken, but I surmise that she was born between 1820 - 1840, so it would probably have been taken in the early 1900s. It's printed on very thick material and is in pretty good condition considering. Just think: in a few months she will be somebody's Great Great Great Great Grandmother. She is from the branch of the family that has been in Canada for much longer than the rest. Three of my four grandparents were first generation immigrants from England, but my maternal grandmother's clan has been here longer. They may even have come here from the USA as United Empire Loyalists at the time of the War of Independence, but I'm not sure. Her married name was Drew, and we think she was born as a Harvey. It seems that her family lived in Williamstown near Cornwall and the St Lawrence River, across from New York State. It's a cloudy morning here near the nation's capital, and the cat is sprawling over more than his allotted space on my tiny computer desk. In fact, it's not really his allotted space to begin with, but I tolerate his intrusion because he's so darn cute. We had a very light dusting of snow last night. As I gaze out my den window, I see the roofs across the street looking very seasonably white, and the Christmas spirit within me is made even a little stronger. Ah, the season! So far we've had the tree decorating party, seen the Santa Claus Parade, welcomed The Holiday Train, had our Christmas potluck at linedancing, and attended a concert at the National Arts Centre in downtown Ottawa. Yesterday, fiddle teacher and I enjoyed our own Christmas jam (as in music rather than spread) of sorts. She had a Christmas CD with an accompanying music book. We sight-read the music and tried to play with the CD – she did and I tried. I was pleasantly surprised with how well I sight-read and kept-up with some of the dozen or so tunes that we played. I did a lot better than I thought I would and had a lot of fun. It was a treat after the last lesson; you might remember that I felt stupid that day. Oddly enough, she didn't recall that outing as being particularly horrific. To top it off the seasonal good feelings, the kids, Bug and Puff, are scheduled to land in Toronto sometime today after their three month sojourn in South East Asia. They'll spend a week or so with Puff's family before boarding the bus to visit us. As plans stand, we'll celebrate Christmas with them rather early, around the sixteenth, in order to give them plenty of time to prepare to head out to Vancouver where Puff is set to begin a new job in January. While having them move across this vast country is not a pleasing prospect, we'll be happy in their company while we can. Meanwhile, we have two more Christmas concerts to look forward to this weekend … and the cat has repositioned himself back to his supposedly allotted space … so life is good. It came to town last Saturday evening. 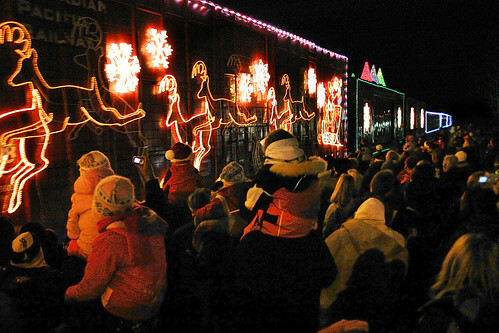 A faint light appeared down the track and got brighter and brighter until the rest of the Canadian Pacific Holiday Train came into view. They told that it had more than a million lights, but I lost count after the first hundred thousand. Happy faces greeted its arrival, and even the kids got all excited. They rolled down the sides of the stage car, and the concert began. This was the first guy, and I don't remember his name. He was followed by well known performers: Wide Mouth Mason and then Lisa Brokop. She was here in the summer too for Riverside Jam. My favourite kid-at-heart was in the Christmas spirit. With events like this going on, who wouldn't be? Of course, Cuppa has posted more photos on her blog. When that mind-blowing (or spirit-altering) job transfer (of the previous post) occurred, I was knocked for the proverbial loop. It seemed like such an awful situation, something that I surely hadn't planned on. If it had just been a transfer, I might have coped better, but everything seemed to go wrong at once: the insane department head, the apparently unfriendly staff, not having a corner to call my own, being in a different kind of school, and teaching out of my subject area. It was a lot to deal with at the time, or it seemed to be, but I was young and still growing up … as opposed to now, when I am old and still growing up. As I said, it seemed bad, not what I had planned at all. And yet … and yet … it turned out to be the best career thing and one of the best personal things that ever happened to me. Once that first dreadful year was in the history books, as they say, I remained in that school for five more years, but everything changed, including me, I guess. By year two, I had my own room and was fully removed from the insane department head and fully welcomed into the warm and friendly embrace of the English department. Frankly, I thrived! It turned out that I loved teaching English, and the students seemed to love me. Not that they really said that to me, but word would get back to me in odd and circuitous ways. It was all rather strange because I had only a few university English courses and hadn't received any training in how to properly teach the subject, but it all seemed to work so very well. It seems somehow profound to me that what I deemed to be so very bad at the time I now deem to be the best thing. I still get all warm and fuzzy over those five subsequent years when I taught out of my subject area in that rural school to which I had to commute in all manner of weather. There's a lesson there, but I can't find the right words to nail it. Sometimes, it's like that for me – when there seems to be some deep truth to convey, I can't find the proper words; the punch line, as it were, eludes me. But I really think that you understand anyway. It's got something to do with keeping an open mind and spirit because we can't always see around corners, and we don't always know what's best for us. I later went back into my subject area, received a promotion, and got transferred back to where I had thought I always wanted to be. I had supposedly set my course right again, but times were never as glorious for me as they were back then, teaching English in the rural school. However, when I am tempted to think that I did the wrong thing by proactively seeking a transfer and promotion rather than remain in that most happy situation, I also catch myself, for without living out both scenarios, it's simply impossible to say which path was the better one. Neither happy nor unhappy situations are guaranteed to endure forever, after all. You just never know. There was a brief time in my life when I experienced depression – or not, depending on your definition. Some might define depression as a lifelong struggle that requires medical treatment. If that's your definition, then I was never depressed. What I mean, however, is that when this state of mind occurred in my life there were months when I felt depressed, felt sad and woebegone. I had been teaching for ten years, but, as the student population began to decline and as my subject area began to decline even faster, I became redundant to my school. I will never appreciate the way in which I was told. The principal stopped me in the hall – in the hall if you please – with the typical good news/bad news scenario. The good news was that I had a job: the bad that it was at another school – out in the county, a rural school to which I would have commute. It would also involve some teaching outside of my subject area. At the time, particularly in view of the manner of the telling, it was hard for not to see it as a form of rejection. Of course, it was strictly a numbers game and nothing personal, but it sure felt personal at the time. When I got to the new school in the following September, I was greeted by less than ideal circumstances. Up until then, I had always had my own room, but in this school my six classes were held in four different rooms. One of the rooms was my department head's. Most of the time, he wouldn't even bother to acknowledge or greet me when I came in. He was insane. He really was and admitted as much years later after he had spent time in prison for attempted murder. It wasn't easy, you see. I was wrenched away from a happy situation and plunked into a highly miserable one. So, yes, I was depressed, to a greater or lesser degree, for maybe six months. Eventually, I escaped into a fantasy land – well almost, or the next best thing. I went to Narnia in the CS Lewis chronicles, and then I went to Middle Earth with hobbits and elves and dwarfs and other manner of creatures. I can remember crawling into bath or bed and devouring The Lord of the Rings in every spare minute. It was a total holiday and escape: not really total because I still had my day job, but it felt close to total as long as I was in Narnia or Middle Earth. My reading didn't stop there. I also read a book about depression. The thrust of it, as I recall it now, was that for most people (those not clinically depressed), happiness is a choice. Oh, it probably gave all sorts of advice about how to get from one state of mind to the other, but I can't remember any of that. What I did get was that for me happiness is a choice. While, I have never taken it in a Pollyanish sort of way, I did buy into the essential concept. I have found that it works. To an extremely large degree, I am responsible for my own attitude and my own happiness. I don't go through life with a silly and giddy expression on my face, but I do experience much contentment and very little dissatisfaction and envy. Although I can't remember when the last one occurred, there are days when a black mood comes upon me, but I try not to permit these moods to last for very long, and it has usually worked for me.